Happy Martini Monday! With the holidays just around the corner, November’s recipe is festive with the colors and flavors of autumn. It’s the time of year when local markets begin to carry holiday fruits and nuts, and this martini reflects those elements with hints of almonds, pears and cranberries. I am very much an amateur at this martini making business, but I’m learning for the current novel I’m working on. I will admit I’m getting better with each recipe and this one is quite lovely. With winter just around the corner, it’s a perfect cozy cocktail for family gatherings, or just an evening with friends. Once again, this should go without saying, but I’m going to repeat it anyway—you need to be of legal drinking age to try this recipe. Wherever you are, may you have a wonderful and safe holiday season! Pour all spirits into an ice-filled shaker. Shake several times and strain into prepared martini glass. 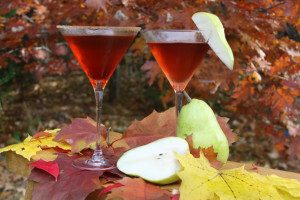 These martinis can be garnished with sliced pear or cinnamon sugar. If garnishing with the cinnamon sugar, prepare martini glass by running a sliced lemon around the rim and tapping gently into cinnamon sugar before mixing the martini. For the cinnamon sugar, mix a tablespoon of cinnamon to a ½ cup of sugar, or to taste. There are several wonderful pear-flavored vodkas on the market, but infusions are easy and lend a natural flavor to the vodka. They just take a little time and prep work. For this recipe, I used half a bottle of vodka and two ripe pears for the infusion. The end results will only be as good as the starting spirits, so use decent vodka. The container must be air-tight and not plastic. Glass mason jars work well, but you can find inexpensive sealable glass containers in most kitchen supply stores. Always sanitize the container beforehand and wash the fruit. Sanitizing solution is available at any brewing supply store. Slice pears in segments (about ½ inch) and remove stems and cores. Place sliced pear segments in your sanitized container and pour the vodka over them. Vodka should cover the fruit. Keep in a cool dark area for four days. 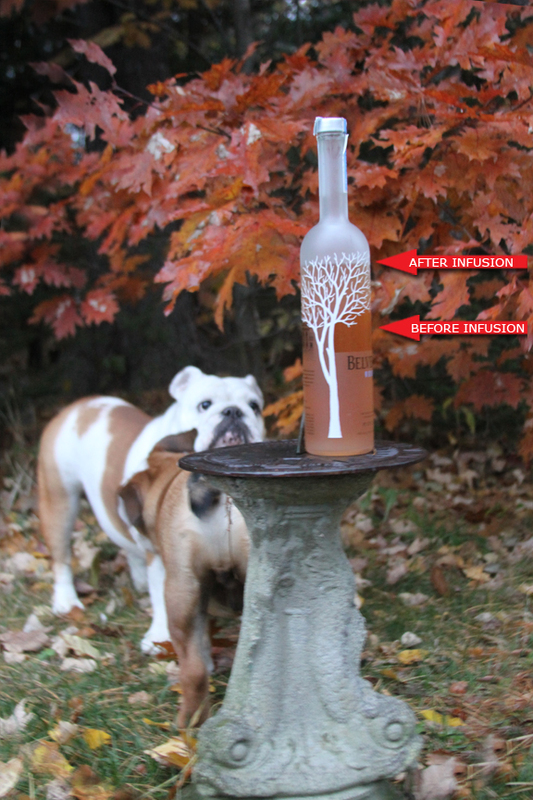 Using a coffee filter or fine strainer, strain infused vodka back into it original bottle. The pears will turn the vodka an amber color and increase the amount of liquid. I’ve been told that the mixture doesn’t need refrigeration, but since the volume of alcohol is decreased by a third (finished photo on the right) I do keep it refrigerated just to be safe and serve within two months.